Spain has long been synonymous with “holiday”, as summer hordes and the blighted landscapes of the Costa de Sol and Blanca sadly attest. Mass tourism is an inescapable reality in the world’s fourth most visited country, yet there still exist regions somewhat removed from the maddening crowds. Catalonia, Spain’s northeast corner, is rich in such places, and along with the Basque country is Europe’s celebrated center of nouvelle cuisine. A multiday road trip up the Costa Brava provides for an unparalleled sampling of landscape, culture, and cuisine; time that will undoubtedly further an understanding of the immense pride Catalans have for their superlative homeland. Our four-day, 250km excursion will take us northeast up the coast towards France and back towards Barcelona via an inland route, taking in 14 towns, numerous sites, and a wide range of Catalan cuisine. The Costa Brava is the northernmost stretch of Catalan coastline, running roughly 206 km northeast from Blanes to Port Bou on the French border. Translated as “brave/wild coast”, the name was coined in 1908 by Ferran Agullo, journalist, politician, and pillar of the Catalan kitchen. Geologically unique, the coast is defined by a series of mountain ranges that run into the sea, with untold numbers of coves and beaches often crowned by pine-topped cliffs. Famed for its vistas and light, the coast has long attracted artists such as Yves Klein and Picasso, and proudly celebrates its native son, the eccentric Salvador Dali. Not quite as famous as Dali, but markedly eclectic and well on its way, Catalan cuisine is enjoying both a profound renaissance and spirited evolution. Widely considered Europe’s most medieval cuisine, and indeed codified in the 14th century, traditional Catalan cooking is an intersection of Roman, Arab, and Gallic ingredients and technique. At its simplest, it’s a seasonal cuisine built on four main sauces and the bounties of farm, Mediterranean, and the Pyrenees. At its most obtuse, it’s a regional medley of odd, seemingly contradictory pairings such as mar i muntanya (sea and mountain), fruit-accented meat and fowl dishes, and a blurring of sweet and savory. Wine, introduced in 600 BC by the Greeks, holds the disparate table together, with Catalonia now home to eleven recognized Denominacion d’Origens. That such an antiquated cuisine should also be at the foundation of Europe’s culinary revolution is an irony not lost on the Catalans. Ferran Adria, a Barcelona-born chef widely considered the “father” of molecular gastronomy, revolutionized nouveau cuisine with his foams, gels, and emulsions at elBulli, his famous restaurant in Roses, on the Costa Brava. Though it closed last summer largely due to finances, elBulli was, and will continue to be, an institution. It will reopen in 2014 primarily as an experimental culinary think-tank, but Adria has hinted, to the relief of many, at impromptu tastings and a brief but bona fide dining season. Today, Catalan chefs, along with their Basque contemporaries, are the vanguard of the avant-garde kitchen, often employing culinary physics in their cuisine. The Mediterranean kitchen, it can be said, has never been more exciting, and Catalonia, with 43 Michelin Stars as of 2012, has never been more relevant. The town of Blanes, roughly an hour northeast of Barcelona, is the gateway to the Costa Brava. A working fisherman’s port of 37,000, Blanes retains an unmistakable charm with its colorful harbor and well-preserved center. The medieval Castle St. Joan dominates the landscape, offering spectacular views, while the old town contains a bevy of architectural gems, including numerous gothic buildings of the Cabrera Viscounts, the church of Santa Maria, a rare gothic fountain, and Modernisme residences. To the northeast are the Marimurta botanical gardens, one of Europe’s finest. Created in 1921, Marimurta showcases over 3000 species of fauna spread over 4 hectares. This surfeit of terrestrial wonder is complemented by the town’s five popular beaches, spread over four scenic and accessible kilometers. Northeast of Tossa, via the spectacular Carretera GI 682, is St. Feliu de Guixols, a charming fishing, boat-building, and cork-producing town of historic import. Like Tossa, St. Feliux (named for the Catalan saint) is popular for its beaches and remarkable scenery, but where Tossa is defined by the medieval, St. Feliux is famed for its Modernisme, enjoying some of the best Art Nouveau architecture in Girona. A great walking town, St. Feliux has two Ramblas (Vidal and Portalet) and a beach promenade (Passeig de Mar). A millennium-old Benedictine monastery and the Hermitage of St Elm provide orthodox religious draws, with the nearby Pedralta (a logan, or rocking stone) a pagan counterpoint. The town of Palamos, ten kilometers up the coast, is home to one of Spain’s last Mediterranean fishing fleets and its only fishing museum, El Museu de La Pesca. Set on the northern end of a small bay below the Les Gavarres massif, this 12h century town is still a fishing stronghold, and its harbor comes alive every afternoon when boats return to unload their catches for auction. Palamos’ sizable shrimp (gambas) are prized throughout Catalonia and believed to be at their best, and largest, between May and July. During this time gastronomy in town revolves around the crustaceans and restaurants offer creative set menus showcasing the prized delicacy. Twenty minutes inland lies La Bisball D’Emporda, a busy market town and important pottery center. Potters have been active here since the 15th century and ceramics a major fixture of the region from the 1800’s. Boutiques and craft stores abound and are complemented by a ceramics school, frequent workshops, and the informative Museu Terrecota. Visitors also come to walk the town’s medieval streets, tour the Castel Palau, and experience the lively farmers’ markets. The sardana, Catalonia’s national dance, can also be witnessed here, as La Bisbal is home to the Cobla Principal de la Bisbal, a famous folk dance band. Due east of La Bisbal is the fairytale village of Pals, one of Catalonia’s most important medieval towns. El Pedro, Pal’s Old Town, is set on Puig Aspre, a hill surrounded by rice producing plains, and is easily identified by its 11th century Romanesque tower. Sant Pere, originally a gothic church but now an architectural hybrid, anchors Pal’s picturesque warrens, and a leisurely stroll will reveal towers, tombs, walls, and fortified houses. Rice from the nearby delta has a protected D.O., and many believe Pal’s historic rice mill to be Europe’s oldest. The Mas Salvi hotel, just outside of town, is an elegant place to sample the cuisine of Pals and the Baix Emporda. Housed in a 17th century estate, the restaurant offers an inspired menu of modern takes on traditional Catalan dishes and is an ideal spot to experience the famous mar i muntanya (sea and mountain, or surf ‘n’ turf) and local wines and olive oils. Meals average e60, with tasting menus from e65. East of Pals is Begur, a quaint and historic village that’s given its name to its surrounding hills and cape. This hamlet sits at the foot of a prominent hill under the historic protection of its 11th century castle. Both its Old Town and nearby Esclanya are mazes of atmospheric streets and impressive Romanesque architecture. Spoiled with eight beaches and numerous coves, Begur’s culinary specialty is rockfish, and from May to June the village holds its annual Campanya Gastronomica Peix de Roca (Rock Fish Gastronomic Campaign). A pleasant 2 kilometer walk up the coast are the remains of Empuries, the most important Greek archeological site in Spain. Dating back to the 6th B.C., Empuries, from the Greek Emporion, or market, was the first Greek settlement in Iberia and has been undergoing excavation since 1908. The village fell to the Romans 400 years later and entered a state of terminal decline. Insights into its colorful history can be had at the Museu de’Arqueologia de Catalunya: Empuries. At the top of the gulf is Roses, the foremost fishing port of the Alt Emporda, and its famous Ciutudella, a military fortification of the 1500’s. It encircles the ancient Greek village of Rhodes (Rose’s namesake), a Roman villa, and the beautiful Lombardian monastery of Santa Maria de Roses. A well-regarded museum ties the many historical threads together. Picasso and late resident Salvador Dali included. Nestled at the top of a peaceful bay, Cadaques’ white-washed buildings and easy grace have delighted visitors for years, even inspiring the Chinese to build a replica. 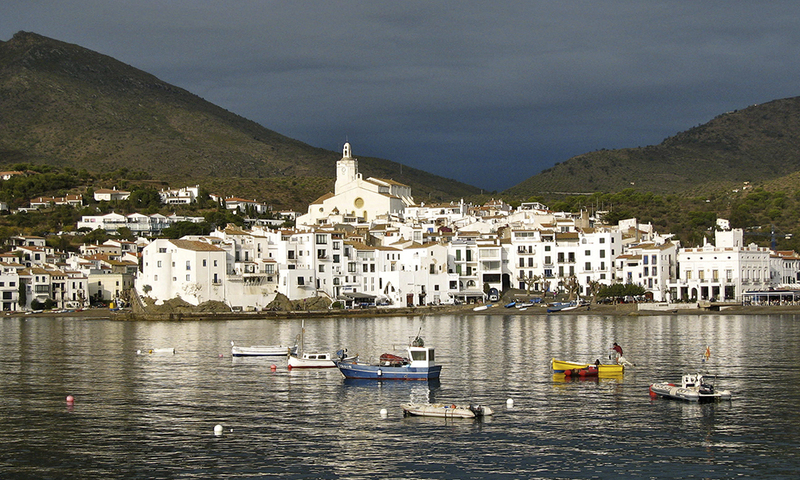 The village boasts a plethora of galleries, an art museum, and the church of Santa Maria de Cadaques. A short walk away in Portlligat is Dali’s late studio/residence, now home to the House-Museum Dali. Taps de Cadaques, a curious plug-shaped pastry, have been made in the town since the 18th century. Cadaques might have been Dali’s inspiration, but his imagination reaches its full fruition in his hometown of Figueres. The Teatre-Museu Dali, a truly surreal experience, was conceived in the 60’s and opened in 1974. Comprising three distinct spaces, the museum is vastly more than the sum of its parts, quite unlike any institution in the world, and a chance to step inside a revolutionary artist’s head. medieval ramparts are now topped with promenades, allowing for unique views of the environs. 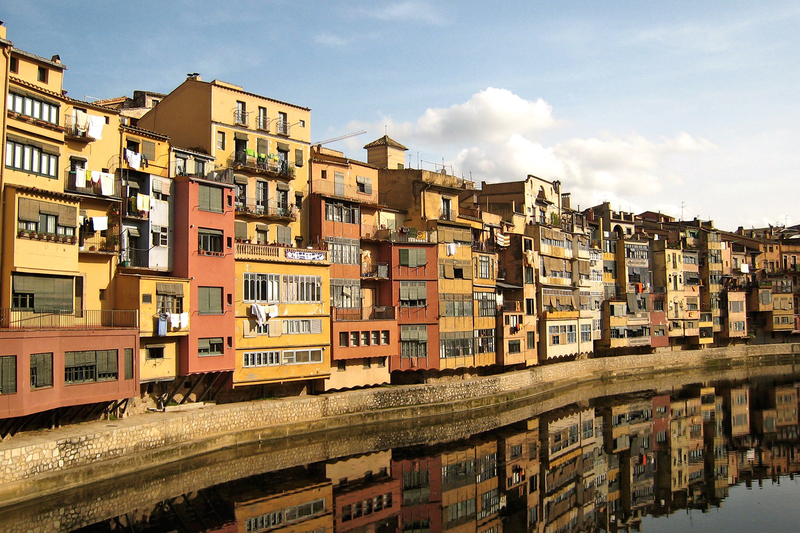 Girona is also home to El Celler de Can Roca, voted World’s Second-Best Restaurant in 2011 by Restaurant Magazine and a 3-star Michelin destination since 2009.